I saw the bright yellow copy of The Power of Others sitting on a shelf of new releases at the library. I didn’t recognize the title, but I hoped that it was on a topic I am very interested in right now, how individuals have influence over one another, our actions, and our ideas. Sure enough, the subtitle assured me that I had found what I was looking for; it read: Peer Pressure, Groupthink, and How the People Around Us Shape Everything We Do. As I’m beginning a new concentration of studies on Creativity and Innovation, I’m finding that the concept of social psychology keeps popping up. Yes, there are some individuals who are perceived as being more creative or innovative than others, but why? Is it something specific within the individual? Something specific that they do? Is it the way the individual reacts to those around them that they become more creative? Is it the way the individual is perceived by others that makes them seem be innovative? For anyone looking to better understand social psychology and the impact we have on one another, The Power of Others by Michael Bond is a perfect read. Bond discusses various aspects of social psychology by using personal interviews and research along with explorations of well-known events in recent history to outline associated behaviors and motivating factors. He addresses how we can begin to feel emotions expressed by those around us, how our individual behavior changes when we are in crowds, factors that can contribute to one person harming another, our concept of what a hero is, how our shared experiences create bonds, why our differences and commonalities can bring us together or pull us apart, and what can happen if we are without others altogether. 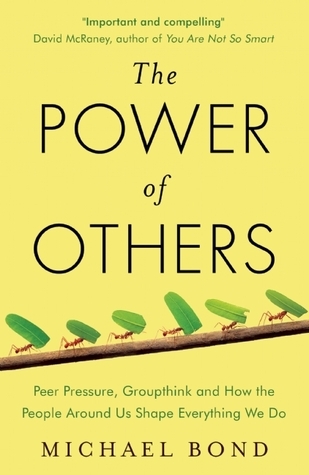 Though I don’t yet have all of the answers to my questions, this book has helped me better understand the concept of social psychology and reinforce the idea that there is most definitely a strong connection between our ideas and the power of others. Next > We’re Going to Turn Into Pumpkins!